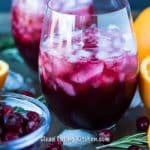 This Cranberry Pomegranate Citrus Mocktail recipe is easy, delicious, and health-promoting for an alcohol-free fizzy drink to serve friends and family. Divide the crushed ice between four cocktail glasses. Combine the pomegranate juice, cranberry juice, and fresh orange or lime juice in a pitcher. When you’re ready to serve, stir the mixture and pour into the cocktail glasses. Top each glass with sparkling mineral water and stir once more before serving.